Sony Introduces TV Show Downloads to PlayStation 3 Users in U.K.
Sony already offers PlayStation 3 users with a number of applications for watching TV shows here in the U.K., such as the iPlayer service from the BBC, Channel 4's 4oD service, and Lovefilm. But in a bid to stay ahead of its rivals, the company has today introduced its own TV show downloads via the PlayStation Network Video Store. In an update to the Video Store released today, Sony introduced the ability to purchase TV shows — many of which are in HD — for as little as £1.49 (approx. $2.31). The content selection is heavily focused on U.S. TV shows, which appears to be the result of a deal between Sony and Sky TV. Unfortunately, the selection of episodes on offer does seem a little bizarre. For example, there are seasons one and six of 24 available but nothing in between or after. Dollhouse season two is available but there's no first season. There's also another big downside: there's currently no option to buy shows by season, which means you'll have to buy each episode individually. Despite these niggles, the feature could be incredibly popular for some users, and hopefully it will result in more content from Sky in the future. The company currently has a deal in place with Microsoft that allows Xbox 360 users to watch a number of Sky TV channels right on their console, and I'd love to see something similar on the PS3. 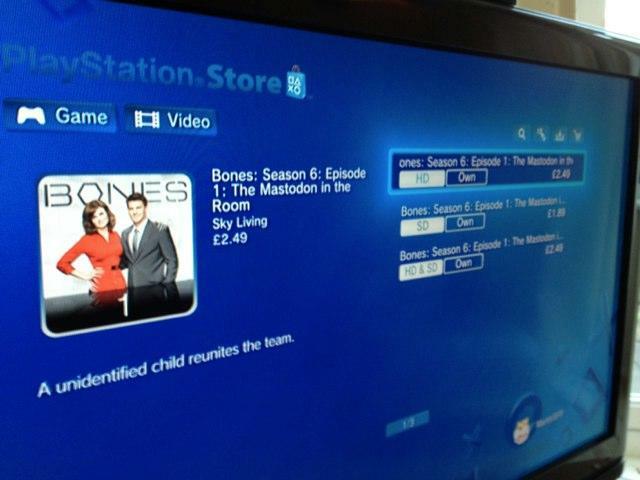 Do you think you'll buy any TV shows from the PlayStation Network Video Store?